By 1906 the printing plates for the 1898 Pictorials ½d, 3d, 6d and 1/- stamps were worn and needed replacing. 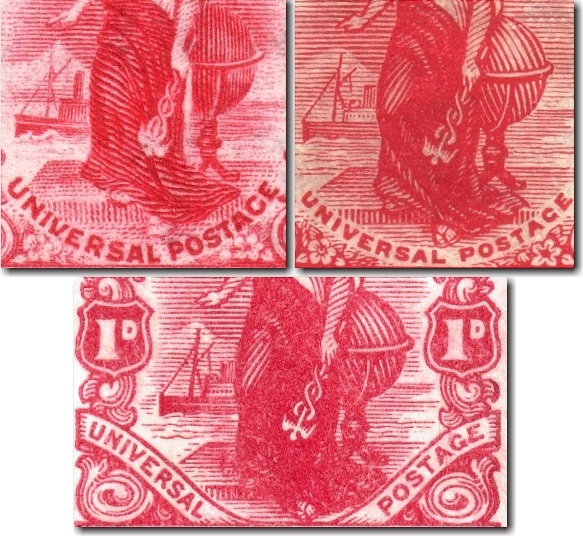 The 3d, 6d and 1/- stamps were reduced in size so that 240 stamps could be printed per sheet. To reduce production costs from the 1901 Penny Universal, the 1d stamp was surface printed. These stamps are easily confused. The 1909 King Edward VII 'penny dominion' (bottom) has a similar design to this issue (top right) with 'Dominion of' added at the top of the stamp and 'universal postage' appearing on a scroll at the bottom of the stamp. Both the 1909 King Edward VII dominion and 1907 Redrawn Pictorials penny stamps have diagonal shading lines on the globe behind the figure of Zealandia. The 1901 Penny Universal (top left) has vertical shading on the globe. The wake at the bow of the steamer is also far more impressive on the 1901 Penny Universal. The 1/- stamp is also quite difficult to distinguish from the slightly larger 1898 Pictorials stamp. The original stamp measures approximately 22.1mm from the top to the bottom of the engraving, the 1907 stamp is closer to 20.9mm.